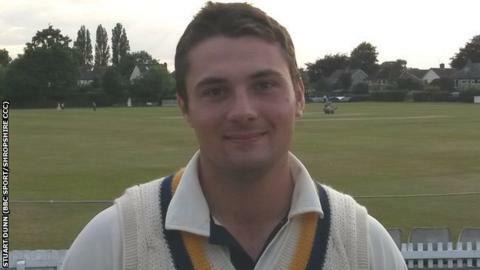 Shropshire have appointed Shrewsbury opening batsman Steve Leach as the new county captain to replace James Ralph, who has done the job for the last season and a half. Ralph, 39, steps down after leading Shropshire to third place in the Western Division of the Minor Counties Championship this summer. Leach, 21, is the younger brother of Worcestershire all rounder Joe Leach. The Shrewsbury School old boy made his county debut in 2011 at the age of 17. "Steve has shown great maturity at a young age," said Shropshire chairman Toby Shaw. Left-hander Leach plundered 702 runs for the county during the 2015 season in six Minor Counties Championship matches, at an average of 70.20, with one century, 170 in the final game against Devon, and four fifties. The Stafford-born player is at Oxford Brookes University studying business management. He made his maiden first-class century in April for Oxford MCCU against a Surrey side including Kevin Pietersen. "He had an unbelievable season, both for the county and also for Shrewsbury in helping them win the Birmingham League title again. "I see him taking the side forward. He's clearly got the passion and he's very proud to have been offered this role. Ralph took over the role mid-season in 2014 after the departure in quick succession of Richard Oliver, to Worcestershire, and Anthony Parker. "I enjoyed playing under James Ralph," said Leach. "He's someone I have a lot of respect for. Hopefully he'll still be a part of the side. It's been an ambition of mine to one day captain Shropshire and I'm delighted it's now happened. The aim is to win things." Shropshire have also upgraded coach Karl Krikken to become the county's first director of cricket, with responsibility for both the first XI and the development squad.